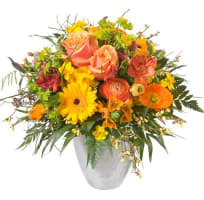 This cheerful bouquet guarantees an energy-charged start to the New Year. It’s a sure-fire way to brighten up someone’s life. The bouquet may include roses, germini (mini-gerbera), ranunculi, poppies, freesias or narcissi. How about it? A surprise is always welcome. Have you always wondered what happens behind the scenes before a bouquet arrives in its recipient's hands? In that case, here's your chance to look over the shoulder of our master florist Marc Müller. In addition to Marc Müller, the star of the video is of course our January bouquet of the month. See for yourself how this sunny bouquet is created with a combination of effortlessness and dedication.